Benue State Governor, Samuel Ortom's advocacy for the establishment of ranches for cattle rearing received the support of the United States of America Ambassador to Nigeria, Stuart Symington. 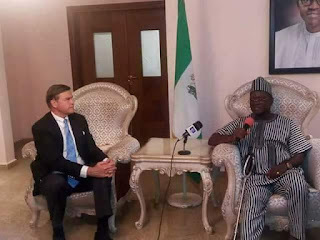 The US Ambassador who visited Governor Ortom at the Benue Peoples House Makurdi, said if cattle are properly reared in ranches instead of open grazing, Nigeria could be one of the highest income earners from milk production. "I come from a family of farmers and part of my family used to move cattle from one state called Colorado to another state called Texas every year and over time they changed until now the cow business that they do is very much one that takes advantage of the land and we have to move them on trucks. "I had a great conversation the other day just outside the city of Jos with one of the great milk producers of the world, a company that produces milk. And I talked to the guy and he was mentioning to me that the milk that comes from the Fulani cattle can be incorporated into the great milk produced here. Literally the future of the nation could be rich when the milk of those herders get fed to the sons and daughters of families and their vegetables get fed to the sons and daughters of the herders. I am happy that you are thinking in this direction Mr Governor", the US Ambassador stated. Governor Ortom thanked the Ambassador for the visit and solicited the assistance of the United States in the realisation of the move for ranches across the country, stating that it is one reliable way of guaranteeing peace in the country. "Let me on behalf of the government and people of Benue State welcome you to Benue. I appreciate your visit. We were glad when we learnt that you are coming to visit us because we look up to America for a lot of things. Today the Presidential system of Government that we practice, we borrowed it from America. "I have been advocating for ranching which I know America for the rearing of cattle instead of the grazing that we have in Nigeria today. Because of the shortage of land, the issue of grazing has become a major security challenge, especially in my state. Frequently, there are clashes between farmers and herdsmen because the land is not there and my people are mostly farmers so they find the herdsmen encroaching and trespassing on farmlands and thus destroying their crops and when they are confronted, it will become a fight and we have lost so much. "I have been calling for the establishment of ranches just like it is done in America. Most of us look forward that our Government at the Federal level and the state level will come together and find a lasting solution because this crisis is not only peculiar to Benue State. There are other states too that are affected. But to me, I see that ranching as it is done in America can solve the problem permanently because the land is not increasing but the population is increasing. "When there were grazing routes in the fifties, the total population of Nigeria was less than forty million. Today, by the 2012 projection, we are over a hundred and seventy million and by 2017, I am sure we will be hitting two hundred million. So it is a big challenge. While we want to support the herdsmen to graze and to rear cattle, it should not be at the detriment of lives and property of our people. And so you are welcome." "America has been supporting us in several ways. USAID has been of great assistance to my Government. Before I assumed office, they were about leaving the state but I invited them to come back for dialogue and since then, they have been of tremendous help to us" the Governor stated.